The Boy from Oz is a jukebox musical based on the life of singer/songwriter Peter Allen while featuring songs written by him. The book is by Nick Enright. Premiering in Australia in 1998 starring Todd McKenney, the musical opened in a revised version on Broadway in 2003 with Hugh Jackman in the title role. 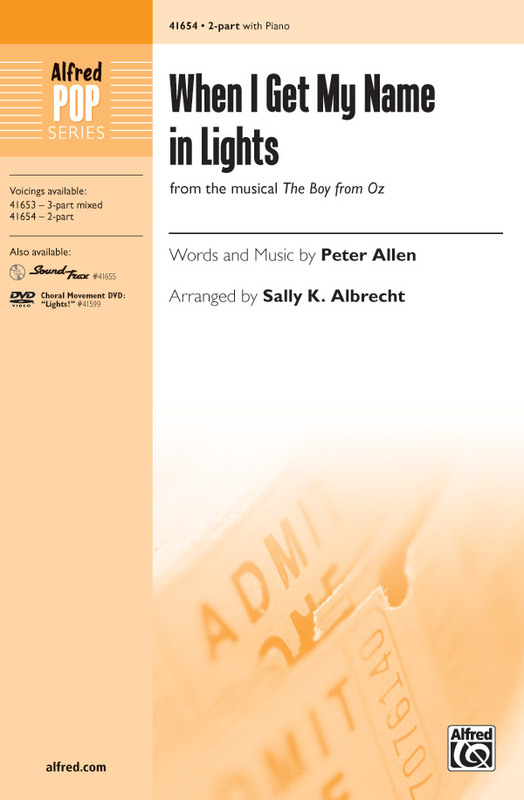 Vocal selections from the musical featuring the life and songs of Peter Allen. Titles include: All the Lives of Me - Arthur's Theme (Best That You Can Do) - Bi-Coastal - Continental American - Don't Cry Out Loud - Don't Wish Too Hard - Everything Old Is New Again - I Go to Rio - I Honestly Love You - I Still Call Australia Home - I'd Rather Leave While I'm in Love - If You Were Wondering - Love Crazy - Not the Boy Next Door - Quiet Please, There's a Lady on Stage - She Loves to Hear the Music - Sure Thing, Baby - Tenterfield Saddler - Waltzing Matilda - When I Get My Name in Lights - You and Me. Dreams of fame and fortune propel this Broadway showstopper from the opening solo all the way to the toe-tapping finish! Add the SoundTrax accompaniment and flashlight choreography (included in the publication) for even more fun.